Purple Circle had another good night at the Cream Awards last night with another Gold for Nottingham Community Housing Association Annual report, NCHA United. We also got a bronze for the work for Nottingham Hoods. They are the new basketball team for Nottingham, where the client liked the design so much, he had it tattooed onto his arm. You can see more of that work here. and their Manager Lee English getting his tattoo here. Overall, that is our 11th and 12th awards of the year, so a pretty good year. If any of you know me, you’ll know that I’ve been a struggling smoker for most of my adult life. It’s my own version of scarcity marketing, in that I find it quite easy to give it up for a month or so, and then think I’m missing out on something, so drift back into it and the cycle begins again. I recently wrote a piece here about Knob Creek and their restricted supply which is pushing demand (and prices) up. The very frustrating Marlboro website that i can get this far into, only to be told that as I don't live in the USA and can't prove i'm 21 or over, I can't access! They don’t have a UK page at all. You can only get past the first page if you can say what state you are in and then give them a real zip code (rather than a series of random numbers). And, according to their figures, its working wonders. The more we are told we can’t have something or shouldn’t do something, the more we strive to do/own it. It’s our own rebel reflex in action and I’m convinced its part of their plan. They make it seem like it’s really worth getting onto and then make you really jump through hoops to get registered. It’s working so well they are now getting 1.5 million unique visitors a month and I haven’t got a clue what they are all dying to see, because I can’t get onto the site to find out. Clever, very clever. But very frustrating. If anyone can get in, can they let me know how they did it? Even though I’m not smoking at the moment. I know I’m going on about Apple at the moment, but they do seem to be in my life a lot for all sorts of reasons. I read today on Brand Channel that Sony are trying to become a ‘lifestyle’ brand alongside Apple. In the article Sony’s Executive VP Kazuo Hirai said that if they can offer movie downloads, game downloads and other entertainment, this would be a point of difference that is not available anywhere else. Sony are officially a Kevin Roberts Lovemark. One of those brands that we love over and above all reason. But this is evidence to me that they have totally lost the plot and are not just following the (Apple) market leaders, but they are a mile or two behind. Sony, when they launched the Walkman, created and defined a sector from scratch with the world’s smallest cassette player. Apple’s iPod then came and took the whole sector from them, when they redefined the portable media player sector. Sony have 33 million PlayStation users across the world, all of them plugged in to a wired or wifi’d world. It would seem a far stronger bet to build on this as a point of differentiation than trying to do it through their Bravia TV, Cyber shot cameras and e-readers, which are all a bit ‘me-too’ at best. If they created a rental or fractional ownership system for games, entertainment, movies and music via the PS3, they would be onto a far more differentiatable (if there is such a word) product and one that has 33 million headstarts. Otherwise for me, its Apple all the way. I can imagine Apple launching a wifi TV – they already have a device that slings your picture from your mac to your TV, a wifi camera (that will be the iPhone 3gs then) and you can already read books on the iPod Touch/iPhone. Sony have become a follower. They used to be radical. Lovemarks do radical things. Sony need to do something radical again, or they are in danger of us falling out of love with them little by little. to deliver the donkey the next day. It’s clear to me that Apple are really getting their act together. One week. Three different examples of Apple getting their act together in terms of their customer services. Apple are in serious danger of becoming mainstream at the moment. They seem to be on everyone’s shopping list and the research recently showed that more houses that have some wealth are choosing to add macs to their home computing set-ups. I wrote some more about this here. What normally happens in line with this growth and move to mainstream, is a level of corporate arrogance that starts the beginning of the end for any brand. But Apple seem to be behaving slightly differently, with three examples that have happened to me this week. This has never happened to me before (yeah yeah yeah, I believe you). So I rang my old friends at Jigsaw who supplied it and they asked me to send it over for a free check to identify the issue. They went through it’s history and advised that it was just under two years old, so out of warranty. As the screen was totally dead, this sounded expensive. The next morning, they called to say that it was a graphics card that had gone. Ouch. That sounds even more expensive. They went on to say that a few of them had gone wrong recently and Apple weren’t happy with this, so would be replacing them free. Result. The machine was returned by taxi the next day in full working order again at no cost, even though it was out of warranty. Wow. This is part of a longer story but I am testing iWork and Pages (Apple’s version of MS Office/Word) in order that we switch all of the Purple Circle machines over to it, next time we need to upgrade. The cost difference for this with 30 licenses is £510 from Apple to £7950 for a Word upgrade. Who says Apple is the expensive option? Pages isn’t perfect, but it is very easy to use and with a more powerful dictionary, will be a better product that Word anyway. I had previously had the trial version downloaded and then wanted to install the full version which I had purchased, but every time I tried, it kept on saying my trial version had expired. aaaargh! So i called the FREEPHONE number on the pack and spoke to a lovely person in Cork (just across the water from my family in Crosshaven), who spent 22 minutes talking me through solving the issue, which she did first time, again at NO cost to me. Wow two. My Godson James had a problem with his iPod and took it back to John lewis from whence it came. After two weeks of sitting on it, they declared it broken and have just given him a brand new one for nothing. admittedly within warranty, but still a new for old replacement without any undue delay. We have been huge fans of Apple since they declared they were going to be different with their unbelievable SuperBowl TV ad in 1984. It was at the time, the best ad I had ever seen and still enthralls me now. It was one of the reasons that I entered the creative world as I wanted to be associated with this sort of brilliance. I liked it so much, I thought I’d share it with you again. Apple are breaking the Microsoft monopoly and they are doing it by producing better products and caring more about their customers. Any brand that does this deserves long term success. This is a set of guidelines released by Apple in December 1996 as to how you should go about building the perfect website. They still seem to ring rather true today, and if applied would improve many current websites. A few of their lessons that they go into in some detail. They do say however that you should Keep Pages Short, which is great in theory but perhaps not the best thing to do in order to make yourself as SEO friendly as you can be. Considering this is nearly 13 years old and was sent to me as a piece of good practice, there is an astonishing amount we could still learn from if we implemented half their ideas today. 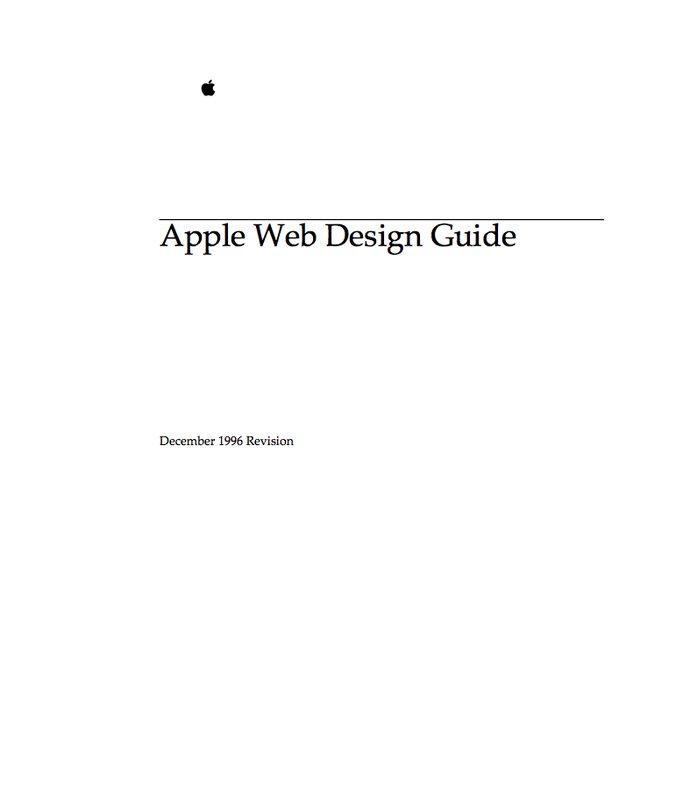 You can download your own copy with this link Apple_Web_Design_Guide. Perhaps that’s why Apple is such a brilliant brand. It has clear thoughts and then sticks to them in all of its corporate and product communications. I’ve spent much of my time this weekend looking for a place to rent for our holidays next summer. It’s one of the most enjoyable bits for me and I just love looking around at who’s letting what and how much they want for it. But this weekend, I noticed something else altogether and that is how few decent platforms there now are offering a good access to rental properties and how undifferentiated some of those competing have become. The one we used to use all the time was Holiday Rentals. These have now either been taken over by, or are changing their name to Home Away, which I have to say is a sightly weaker name than they have already. The .com name takes you to a more US based site and the old UK name takes you to the interim UK (ish) site. The site that seemed to have the most property in the area we were looking was actually another one called Holiday Lettings. I didn’t realise at the time, but this is part of Rightmove and works very well indeed. But the one that really shocked me was Owners Direct (UK). It may be my imagination, but this is the one that started the direct rental revolution many years ago (even though Holiday Lettings claim it is ten years old!). Will the real Owners Direct please step forward….. They are in a situation where the four simple combinations of their domain name are owned by different people with totally different sites. http://www.owners-direct.co.uk/ is dreadful holding page. And http://www.owners-direct.com/ is another portal style site that doesn’t really have any stock. But, for a market to be this confused is terrible for customers. It’s a simple lesson to any brand or business owners as to why you need to be really clearly differentiated in the market you address. It’s not always important to say exactly what you do in your name (the Ronseal, does exactly what is says on the tin school of thought) but it’s absolutely vital that it is very clear who you are and what you stand for. The alternative school of thought (the Egg, Orange O2 model) is one that has an equal place but is perhaps now done to death in certain markets as we run out of fruits, colours and fluffy animals with an available domain name. It’s a basic fact that If you look the same as your competitors, your customers will not know who you are and why they should talk to you. Perhaps that’s why all those years ago we called our business Purple Circle and not the very forgettable Fisk, Lyle, Slack to join the army of three name acronym design agencies that dominated the early 90’s. The rules are still the same now, and I’m truly amazed that there are still some site/brand owners, like Owners Direct who haven’t learnt them. If you’re a developer or know someone who is and they feel like a change of scene to come and work at Purple Circle, then click this link to read the role definition of exactly the type of person we’re looking for. The job is a full time position based in our Nottingham studio and is to start in January 2010. At Purple Circle, we’ve won lots of awards over the years and we’ve been around since 1991, but we’ve never been as strong as we should be in the online world. The work will be varied and start with rebuilding our own site to incorporate all of our social media content and making sure that Google and the other search engines, love what we’re doing as much as we do. To find out more about Purple Circle, click here. Look at our blog here. And download the web developer role definition here. Is £1 the new brand battleground? The old Woolworth’s in Nottingham, Victoria Centre is now the new Poundworld. It’s apparently the biggest they have, so I thought I’d have a look around it. Most of their stock isn’t for me, but I guess I’m not their target audience. They have some great value Johnson and Johnson facewash and 3 cans of diet Cherry Coke – all for the bargain price of £1. They have electrical items, hygiene and bathrooms stuff and almost anything youcould possibly need to kit out the perfect value house. But what really surprised me was the fact that they have a chiller. In this chiller are Richmond sausages, 2 litre packs of milk, back bacon (in slices of six), vile Rustlers burgers (priced up at £1.49!) and a sandwich selection that even includes Coronation Chicken on a brown bread – again, all for £1.00. Is £1 the new battleground – Judging by their hideous sandwiches, I think not! Purely in the interests of research, I bought one of their Tuna mayo sandwiches and can report that it was truly disgusting. I ate one half of one sandwich and threw the rest away. For a gannet like me who considers chiller grazing in garages as top fodder, this is highly unusual behaviour. Greggs across the way however have a new offer of crusty cobs with ham or cheese at only £0.80 each or both for £1.55. Now these are lovely. Fresh, crusty, made in the store on the day and remarkable value. I can honestly say, because the £1.00 sandwich was sooooo bad, that it will make me look with some deep suspicion at every other thing they sell too. Proof again that one bad brand experience can reflect badly on your entire branded offer. Don’t just look at some of the elements of what you do with your brand, Look at all of them. So no, £1 isn’t the new battle ground. It’s £0.80. Thanks to James Cridland for his Poundworld facia shot. You can see more of his stuff here. It’s a bit of momentous day for me today as I have just been out and bought a Moleskine diary. This probably isn’t that momentous for most people, but it is an indication for me of a structural change in the way I work. I bought a Filofax years ago – when I was still at college in fact – and have kept all of my diaries dating back over 20 years. I’ve seen off a few covers, but the format of the inners have remained broadly the same. Over this 20 year period, I have now switched almost completely to a shared online diary – as most of us who work in groups have done too. Google Calendar is our calendar of choice and it works brilliantly. It allows others in the team to make appointments for me and then invite me along. When I get those invites, I add them to my Filofax diary, so the two should correspond perfectly. Because I never carry my Filofax anymore. It’s not that it has become any chunkier, it’s just that I now only carry a laptop bag with me 90% of the time, and this doesn’t have room in it for a big chunky Filofax. It does however have room for my new best friend the Moleskine notebook. On my trip the US recently, I carried it everywhere and it is full of little notes and reminders of that trip as wel as ideas and notes for blog posts. It has quickly become a very treasured little possession. I liked it so much, that I have been out and bought the matching Moleskine diary. Week to view, with a detachable address book section in the back. On Amazon at a bit under £8.00. You too can be a bit like Hemingway yourself, by buying some of his heritage here. I completely understand that this isn’t significant in any way to most people, but to me it shows that they way I buy and the way I behave is now different. Filofax have changed and are doing lots of cool things with Twitter, Facebook and limited edition books, but they can’t really influence the size of the bag we carry and this alone has changed my behaviour. I look at the branding work we do at Purple Circle. Yes it’s still branding. But it isn’t branding like we were doing 20 years ago. I’m looking at our own industry and wondering where the next structural change is going to come from. I suggest you do the same.